My work deals with fragmentation and unity and repetition and variation, and that's where printmaking really lives." A portfolio of nine color sugar lift and spit bite aquatints with soft ground etching. Image size: 4½ x 4½"; paper size: 5¾ x 5½". Edition 20. Published by Crown Point Press and printed by Case Hudson. Color sugar lift and spit bite aquatints with drypoint printed on hosho paper gampi chine collé. Image size: 23½ x 30¾"; paper size: 30½ x 37¼". Edition 10. Series of 30 unique color spit bite and sugar lift aquatints with hard ground and soft ground etching. Image size: 9½ x 24"; paper size: 15 x 29¼". Brown has done two projects in etching at Crown Point Press in 1999 and 2001. In the earlier project, he used dice to settle on whether to pour, paint, drip or blow the acid for each mark he made on a plate. Finally, he cut the plate into sixteen equal-sized pieces and asked the printers to assemble them randomly to produce a series of unique works rather than an edition. He has also worked extensively in lithography at Shark’s Ink in Colorado. Brad Brown has been a Richard C. Diebenkorn Teaching Fellow at the San Francisco Art Institute and was awarded a residency at Arcus Project in Moriya, Japan. He has had solo exhibitions at the Museum of Contemporary Art in Denver and the Jundt Art Museum in Spokane, Washington. His work is in the collections of the Museum of Modern Art, New York; the San Francisco Museum of Modern Art; the Palace of the Legion of Honor, San Francisco; the Arkansas Art Center, Little Rock; and the Boise Art Museum, Idaho. Brad Brown lives and works in New York City. He is represented by Larissa Goldston Gallery, New York. 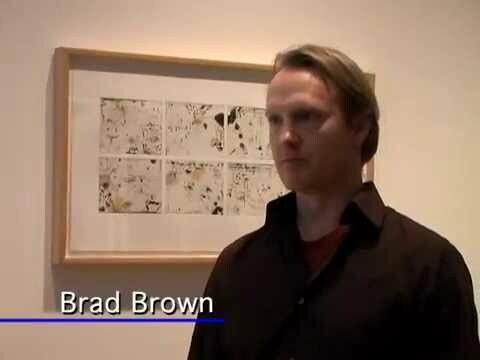 Artist Brad Brown discusses printmaking at Crown Point Press in San Francisco, 1999.